Do you have problems with your stairs? 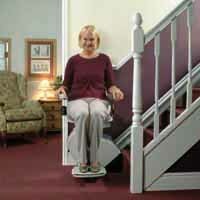 An ACORN Stairlift could transform your life. Giving you back easy access to all floors of your home. 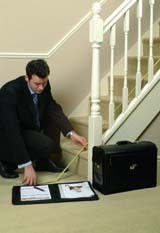 Within three days of calling to enquire about an ACORN stairlift, you could be using the stairs with ease. 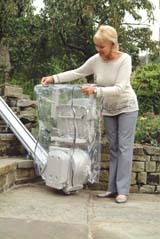 For over 10 years, ACORN has manufactured and installed thousands of its own Superglide Stairlifts across the UK and the world. 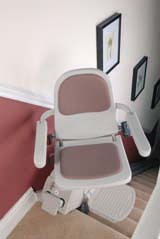 With over 100,000 happy customers worldwide the ACORN stairlift truly is world class. We provide exceptionally reliable, safe and easy-to-use stairlifts to meet all of our customers' needs. The Stick Man is proud to be a Partner of Acorn Stairlifts.  Easy to use joystick.  2 x remote controls.  Smooth start/stop - no jolts!  Fold-up seat, arms & footrest.  Safety sensors - lift stops if any object gets in the way.  Maintenance free battery (DC) power - lift will still work during a power cut!  Electronic and mechanical braking systems. 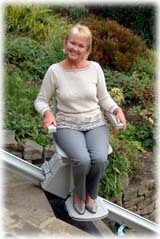  Outdoor stair lift model available. 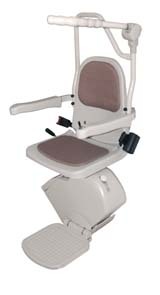 A swivel seat makes it easier and safer to mount and dismount. The seat folds out of the way when not in use. Our professional fitters take great care to meet your personal needs. All the stairlifts are manufactured in Acorn's own factories so individual requirements can be met. Be free to enjoy your garden again! 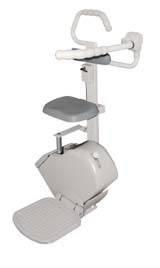 If you have difficulty sitting we have several sit/stand models available. To request a free information pack, DVD or video, or to have one of our experts contact you please email us (click on the link). Or phone during working hours on 01439 771450. 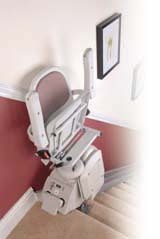 You could be using your own stairlift within a few days - no long waiting periods!